If you're about to go away for vacation with your family, you'll want to do these 16 checklist items. That way, you'll have a secure, comfortable, and stress-free homecoming. 1. Keep the air conditioner on. Set it to 82 degrees Fahrenheit to prevent mold and mildew from growing. The house will stay cool enough so that you won't come home to a sauna, but your utility bill won't be sky high. Likewise, leave the heat on. I set mine to 67 in the cold months when I leave home - keeps pipes from freezing. 2. Run the dishwasher. Empty it and leave the door open so it won't get stinky while you are away. Don't leave dishes in there. 3. Put a timer on a lamp in the kitchen. Set it to go on and off randomly. There's always someone looking for something to eat at all hours at my house! Turn on the outdoor lights at all entrances. 4. Turn off and unplug all small appliances. Unexpected power surges can damage your stuff and cause fires. If you have things plugged into a surge protector, that's good, but go ahead and turn the surge protector off. 5. Prune tree limbs. If possible, try to schedule a tree trimming a week before your want to leave. Any precariously hanging tree branches and wreck your house during a storm. You don't want to come home to no roof and a flooded bedroom! 6. Don't advertise to everyone that you're leaving the house empty. Try to refrain from posting vacation pictures until you get back. Don't change voicemail messages that tell anyone who calls that you are not there to defend your castle! 7. Turn of the water to the washing machine and the dishwasher. Look for the handle under the sink for the dishwasher and behind the washing machine. If a leak springs from the hose supplying these appliances, you'll be very unhappy! 8. Give your hidden key to a neighbor. If you've hidden a key under a ceramic frog or other emergency place, remove it and give it to a trusted neighbor. That way, they can enter your house if necessary, but no one else can using that key. 9. Check windows and doors. Make sure everything is not only closed, but locked tight. You don't want intruders, rain, or that super intelligent raccoon to get inside! 10. Flush all the toilets. Leave the lid open so they don't get stinky with stagnant water. 11. Check gutters, drainspouts, and drains. Don't come home to a flooded basement or leaky roof because your gutters, drainspouts, or drains were clogged during a big storm. Don't forget to check the drain in the walkup steps from your basement if you have one. 12. Check your sump pump. If you have one, take the time to vacuum it out with a wet/dry vac and check that it works properly. Pour a bunch of water (or from a hose) into a drain that you know leads to the sump pump to test that it pumps out the water. You do NOT want an overflowing sump pump as a welcome home! 13. Ask a trusted neighbor to check on things. And, to bring in the mail, newspapers, deliveries, etc. - so it's not obvious to passers by that you're not home. If you can leave them a key, ask them to take a peek inside every few days. 14. Park a car in front of the garage. That way, you block that huge entrance (makes it harder to sneak your awesome flatscreen TV out the garage). Remember to remove the garage opener from your car. Unplug the garage opener so sneaky burglars can't use some kinds of device to get your opener to open! 15. Turn on the house alarm. Notify your security monitoring company that you're leaving town. Give your trusted neighbor, a friend, or relative your alarm code, the contact information for the alarm company, and of course your contact info in case something happens. 16. Test your smoke detectors. Yes, it's loud and annoying, but DO IT! 17. Hold your mail. If you're going to be away longer than 3 days, ask the post office to hold your mail unless you have someone taking it in for you at least every other day. A super full mailbox is annoying to the mail carrier, and a dead giveaway that you're not home. Go to https://holdmail.usps.com/holdmail/ to set it up online. 18. Turn off outside water. Once, I came home to a flooded yard and a HUGE water bill because my spigot had been left on by my child. Not fun. At all. 19. Final check on the stove top and oven. As you're leaving out the door, take a final quick look to make sure the stove top and ovens are off. Don't just eyeball it, physically check the knobs if possible. 20. My favorite. Plump up a bean bag chair. 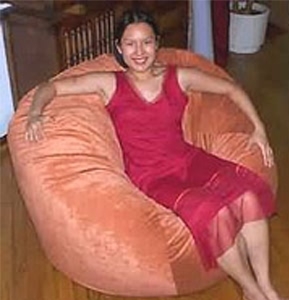 Yes, when I get home from a trip, and feel like I need another vacation because of running around on this vacation... it feels nice to be able to drop the bags, plop down into my plumped up bean bag chair, and watch some TV before having to get back to reality. The kids will love this part of coming home too. It beats having to unpack right away! Did I leave anything out? Do you have suggestions on what to do before you leave to go on vacation? Please share and make it easier for everyone to leave and come back!